The trail initially crosses the Bhote Kosi, flowing down from Tibet, literally a few kilometres away, and then gradually climbs up through the sub-tropical forests, teeming with bird-life, to join the trail from Syabru. We then follow the river, climbing though uninhabited forest of oak and rhododendron and maybe catching a glimpse of langur monkeys roaming through the trees. We climb along a steep trail to our camp in the forest. As we continue climbing there are occasional glimpses of Langtang Lirung between the trees. At Ghora Tabela [3000m] the trail emerges from the forest. Once there was a Tibetan resettlement project here, but now it is a Nepalese army post though it has no permanent inhabitants. The trail continues to climb gently and the valley widens, passing a few temporary settlements used by herders who bring their livestock to graze in the high pastures during the summer months. There is a monastery which we can visit shortly before arriving at the village of Langtang, the headquarters of the Langtang National Park. The houses of Langtang and its neighbouring villages are of the flat-roofed Tibetan style, surrounded by stone walls enclosing fields of buckwheat, potatoes, wheat, turnips and barley. The trail climbs gradually through small villages and yak pastures as the valley opens out further and the views become more extensive. After crossing several small streams and moraines, the trail reaches the settlement at Kyangjin. Here there is a small monastery and a government-operated cheese factory. We should arrive at Kyangjin by lunch time allowing time to acclimatise and explore the area. It is a dramatic setting with snowy peaks surrounding us in all directions. We continue retracing our steps some of the way to Syabru Besi, but then branch left up a steep path through forest to suddenly emerge with a view of Syabru and its extensive area of millet terraces. An undulating path brings us to this fascinating village where each house is set above its neighbour, in a long line up the very crest of the ridge. It's a great place to wander about, catching glimpses of Tamang life, admiring the beautifully carved wooden windows or simply relaxing in the sun. From Syabru it is a steep climb through forests of oak, fir and rhododendron to the top of a ridge. From here it is only a short descent to Sing Gompa. There is a Buddhist monastery and a small cheese factory here. From Sing Gompa we climb a ridge to the main Gosainkund trail. There are good views across Langtang valley to Langtang Lirung. To the west there are dramatic views of the Ganesh Himal and Manaslu. Eventually, the trail descends from the ridge to the first of three lakes, Saraswati Kund. The second lake in the chain is named Bhairab Kund, and the third, Gosainkund. This lake is particularly sacred and a place of pilgrimage in the summer. According to legend, this lake was created by Shiva when he pierced a glacier with his trident to obtain water, quenching his thirst after taking some poison. 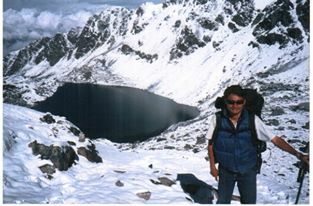 The trail leaves Gosainkund and climbs through rugged country, past four more small lakes to the Laurebina La [4610m], the highest point of this trek. Keep looking back for spectacular views of Manaslu and the mountains of the Ganesh Himal, as well as the now familiar Langtang Lirung. We then descend steeply to camp near Gopte. We continue descending along the ridge, through rhododendron and juniper forests to a stream before climbing to Tharepati, a group of herders' huts at 3490m. From Tharepati the trail gradually descends through pine and rhododendron forest with good views down into the Helambu valley and across to Jugal Himal and Numbur in the Solu Khumbu. From Mangan Kharka it is a short climb to cross a ridge before following a pleasant trail through forest, with superb views across to Number, the Jugal Himal and many other snow-capped peaks. From Kutumsang, we climb to a pass at 2620m, before descending to the Tamang village of Gulphu Bhanjyang. We camp beyond Gulphu Bhanjyang on a ridge with splendid views, stretching from the Annapurnas and Manaslu in the west to Numbur in the east. From our camp it is an easy climb to a small pass before descending to Pati Bhanjyang, a large Tamang village with a few shops and a police check post. From here it is a 2 hour climb to Chisopani and our camp. Leaving Chisopani, the trail passes through meadows and cultivated fields and then climbs through oak and rhododendron forest to Burlang Bhanjyang. From here there are magnificent views, from Annapurna in the west to Ganesh Himal and Numbur in the east. This ridge marks the northern rim of the Kathmandu valley. We now begin descending steeply through dense forest of oak, pine and rhododendron to cross a dam and then follow a large water pipe which supplies much of the water for Kathmandu. 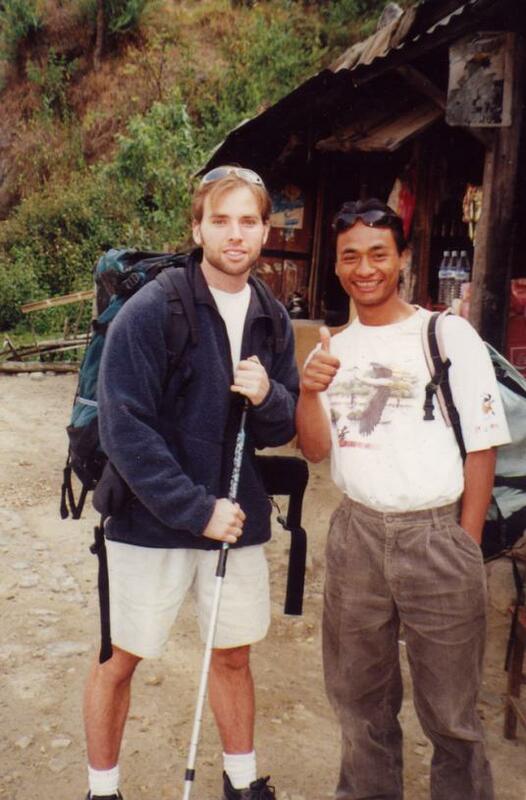 Soon we are down into Sundarijal where we pick up transport back to Kathmandu and the comforts of our hotel.